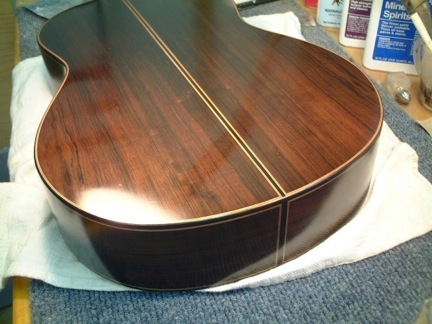 Brazilian Rosewood is generally considered the best tonewood by most luthiers as long as the quality is up to standard. I know I certainly do. Brazilian can yield a dark bell like sound that is both deep and brilliant. I know of no other wood that can quite match it. I maintain an inventory of this rare wood that has been selected for tone reasons first and aesthetics always. Handbuilders like myself can with perseverance and luck still find very good Brazilian in small quantities. Most of what I have is old growth, mostly very dark with great tap tone and mostly quarter sawn. The old pre-war dark reds with black spider webbing are gone with rare exceptions. I won't sell Brazilian in a guitar unless I think it can make a difference. Brazilian has great variety in the figure and unlike most woods, excellent tone can come from some highly bizarre looking wood. My preference as a builder is for the more straight grained wood as I want the instrument to be as stable as possible.